With just a few weeks to spare before the deadline of my local quilt guild's (Courthouse Quilters) challenge, I managed to put together an entry that ultimately won 1st place! 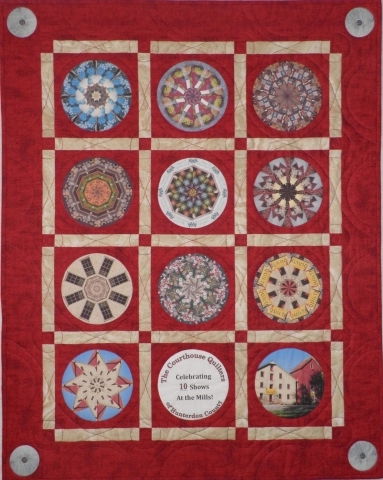 The challenge rules stipulated that the quilt contain "10" of something- anything to celebrate the guild's 10th show at the Prallsville Mills coming up this October 5-7. It also needed to have bits of red and tan to represent the mills. My inspiration was the large round millstone I took a picture of at our last show in 2010. Also having recently purchased Kaleidoscope Kreator 3 software, I created round, 8-sectioned kaleidoscopes form various images I also took at the 2010 show. Some kaleidoscopes were much more obvious than others - but that was the fun part - watching the guild members try to guess what images/scenes could have possibly made the various kaleidoscopes. I will post the original images on my website. Can you guess which ones correspond to which kaleidoscopes? Join us at the10th Quilts at the Mill Quilt Show in Stockton, NJ October 5-7, 2012! There will be a special exhibit of all of the challenge quilts as well as many more beautiful quilts to gaze at, chances to win our member-made raffle quilt or mini quilts, handmade items to purchase at our boutique and plenty of vendors to shop at! Please go towww.courthousequilters.comfor more information on the show! See you there!